_We have seen and heard a lot of questions on what is a good shell set to start off with in learning the three shell game. Most of the time the reply they get is to start off with a cheap set and work up to a good set. This is fine for the one that just wants to know how the game is played or to see if it is really their thing, but for the serious one that wants to learn the right way. You are not giving yourself a fair chance from the start. We believe the three shell game can be played at two different game levels, the original con-man way or the magician way. They are different. The con-man designed his tools to con people out of their money with the rules of gambling. The magician's tools are designed for entertaining people who bring different rules for play. It is like apples and oranges in what is expected. The timing is right to bring in a new designed magician shell as these shells will give much more surprise and entertainment to even the ones who know how the game is done. This old con game has been around so long that it has become very well known and most routines are pretty much the same. If they don't know how it works, it is pretty easy to figure out if they want too. This is not the case with the new Bottom Ridge Shells as they were designed so that the pea never comes out till you want it out. This is a big advantage over everyone, even the people that know how the old shell game works. It is a magical shell now and can be handled by anyone without revealing any secrets on how the game is done. There is no reason for all the alterations of the shell like the Chanin Dip and the inverted "V" notch as they are just more clues on how it is done. They are not needed for common bottle caps, matchboxes, or any other shells being used. Only the old designed walnut shells have these alterations. 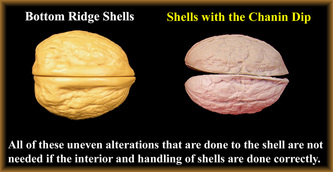 Bottom Ridge Shells and the True Walnut Shells are all made without these unneeded visual clues! See photos at bottom of page to fully understand what I am talking about. The inverted "V" notch and the Chanin Dip alterations to the shell are a sales gimmick that people actually believe they need. Check out the video below that previews the Bottom Ridge Shells which has an entire flat surface and see for yourself. The thing that I think is so funny is the con-man displays less clues on how the game is done than the magician showing how the con man plays the game. Something is wrong here! So the first step in picking the right set of shells - You need to decide if you want the old design or the new design shells to be used for money or entertainment. Listed below are different user classifications and the type of shells normally used with each class. Shells used: Bottle caps, matchboxes and just about any common item to move a soft ball under. Can be picked up anywhere and able to get rid of quickly if needed with no big lost as this type of usage is against the law. Close-up magic Shells used: Standard Walnut Shells - many different grades from different suppliers. Check this site: True Walnut Shells, Walnut Bottom Ridge shells, Walnut Carved Holy Shells, Magic Peanut Shells, Pea Pod Shells and Limited Edition Blackbeard Shells and many others. The new Bottom Ridge Shells are without all the old clues and rules. Everything can be fully examined at any time without switching anything out. Able to move the shell in any direction with a soft pea and have the pea remain within the shell. Able to get the soft pea in and out of the shells undetected known only by the magician. Standard pea is a rubber metal blend that can work with or without magnets and can act like a hard or soft pea at any given time. 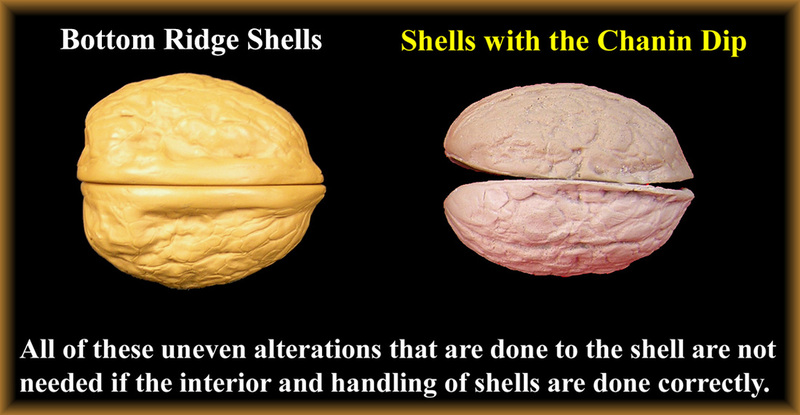 The shells can hold a hidden load when lifted from surface Now this is a magical shell! Shells used: Check this site ~ Gator Shells and Monkey Shells and the new Gator shells. In the past the three shell game has not been used for entertaining kids. But the Candyman shells and Monkey shells are designed for fun and entertainment for kids. The kids will love them and the kids will always win. If you perform kids parties you will love these shells! Can carry with you all the time. *All the photos on this site are very large to show you the true quality of the products that you will get. The Bottom Ridge Shells brings a whole new ball game to the table without all the clues and rules.